Can I claim the VAT? There’s always been a very busy market for any sort of professional training; from tax and accounting, to making money from the stock market and, of course, property development. Most of these events cost a lot of money, especially in the Greater London area, with people paying £1,000 to £2,000 a day for the benefit of listening to experts in their field. Then there’s the travel and accommodation costs, which can add several hundreds of pounds to the total bill for the event. So I’m often asked if businesses can claim VAT on the cost of such events and how to do this when the invoices from conference supplies don’t show VAT separately. Under normal VAT principles, VAT on conferences and training courses is “input tax”. This means that the business can claim the VAT from HMRC depending on whether the courses relate to taxable sales made by the business. This is the normal VAT rule and many of you will already understand how this works, but it’s worth explaining things in a bit more detail now and again to avoid any confusion. • Businesses that make taxable supplies at any rate – including sales at 20% and 5%, as well as zero rated residential property sales – can recover VAT on goods and services used to make those supplies apart from certain specific costs such as the purchase of cars and client entertaining (“blocked input tax”). • Businesses making exempt supplies – such as short term residential lettings – can’t normally claim VAT on goods and services used to make those supplies. This VAT is called “exempt input tax” and can normally only be claimed if it falls within certain “de minimis” limits, which are currently £625 per month on average and 50% of the business’s total input tax. • VAT that doesn’t fall wholly into either of the above categories is called “residual input tax”. This VAT must be apportioned between the exempt and taxable activities (usually by reference to their relative values). The proportion relating to the taxable activities can be claimed, while the remaining exempt input tax is added to exempt input tax on costs that can be directly attributed to exempt supplies and claimed if it falls within the de minimis limit. The VAT recovery rules can be very complicated and particularly for property developers, whose business activities can generate both taxable sales (e.g. sales of new dwellings or new commercial properties) and exempt sales (sales of other properties and rental income). This means that a property developer’s VAT recovery position will change according to its business activities, which affects how much VAT it can claim from HMRC. Company director Bill takes 2 senior managers (Mike and Sam) on a training course. Mike works in the new housing division which generally makes zero-rated sales of new homes, while Sam works in the renovations division, whose sales are normally VAT exempt. • The VAT paid on Mike’s invoice can be claimed because he works in the division that makes zero-rated sales of new homes. • The VAT on Sam’s invoice is “exempt input tax” because his division sells renovated homes. • The VAT on Bill’s cost is “residual input tax” because as a director, he works in all parts of the business. His VAT will be apportioned between the “taxable” and “exempt” parts of the business. The total “exempt input tax”, including the VAT on Sam’s invoice and a proportion of the VAT on Bill’s invoice, can only be claimed if the total exempt input tax incurred by the business as a whole falls below the de minimis limit. What if VAT isn’t shown on the invoice? If VAT isn’t shown on the invoice, it’s probably because of a very specific VAT accounting scheme. Normally, VAT registered businesses claim VAT on their costs and charge VAT on their taxable sales. However, conferences and training course usually fall within a VAT accounting procedure called the “Tour Operators Margin Scheme” or “TOMS” for short. This applies to package holidays and other types of travel/accommodation combinations (including theatre trips, food and drink and training courses) where the organiser purchases these supplies and sells them on, unaltered, as a package to the customer. Under the TOMS, the organiser can’t claim VAT on the costs but only has to pay VAT on the profit margin to HMRC. Also, the customer can’t claim any VAT on the price. You can find more detail about the TOMS in VAT Notice 709/5: Tour operators margin scheme http://tinyurl.com/qhqenzq. 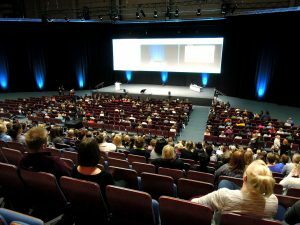 If you’re planning to run your own conference, how do you know whether a conference falls within the TOMS? The normal rule is that if you only charge attendance fees and attendees arrange and pay for their own travel and accommodation, then your conference does NOT fall within the TOMS and you charge VAT under the normal rules. However, once you start buying hotel rooms, rail tickets, taxis, etc to be used by the attendees and sold as a package, then it’s likely that the TOMS will apply. Check out the rules in Notice 709/5 for more information. Previous Post LPG home heating – What are my options?